Ready to add a tournament event? You do not need to have all the details of your event ready before publishing your event. In fact, we recommend publishing your event as soon as possible so coaches, players, and fans can follow your event and you can begin to communicate updates to your intended audience through the app. Not sure which to do? Hint: Leagues are spread over longer (typically seasonal) periods where teams don't necessarily play every day. They can culminate in a championship tournament or weekend. Tournaments are short-term competitions (typically a few days) where losing teams can be eliminated. 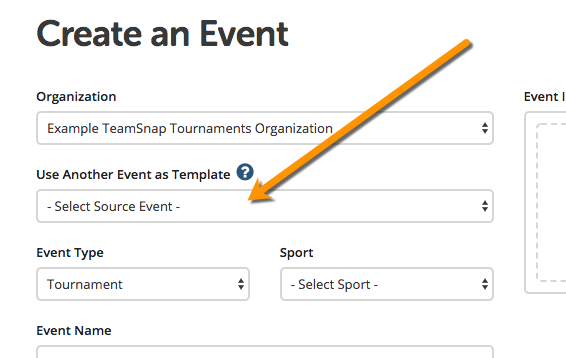 To copy an existing event's settings, divisions, and registration configuration, select the existing event from the Use Another Event as Template drop-down. Daily event times, event venues, blackout dates, and registration dates are not copied over. Once the tournament is Published you will head to the Promote tab (click Manage under to the tournament name) to get the tournament event links and instructions to share with the public to get the tournament app and follow their team.